Large Home GREAT for Large Families, HUGE Private Pool, Private Beach Access, Seasonal Beach Service, and a Summer Kitchen! Welcome to Born To Sun! “Born to Sun” is a stunning 5,200 sq.ft. luxury home featuring 9 bedrooms, 10 bathrooms, a private pool/spa and an outdoor summer kitchen! This beautiful home was completed in 2016, and can accommodate up to 31 guests comfortably. All three levels of this home are easily accessible with the use of the private elevator. There is ample bedding throughout the home with 7 King suites, 1 Queen Suite and a custom-built bunk room for 7. A Brunswick pool table is located on the second floor, and the media room located on the third floor is perfect for kids in the evening. “Born to Sun” boasts one of the largest private pools in the Frangista Beach community. The pool is approximately 30’ x 20’. The attached spa offers built-in seating for 8. Swim up to the underwater bar stools or seat-ledges and relax at the in-water table. This is the perfect vantage point for the 60” TV located in the outdoor kitchen. You can also enjoy the pool deck while sunbathing on the 8 comfortable lounge chairs provided. At night, the beautiful LED lights illuminate the pool, making for a truly mesmerizing view. The fire pit is the perfect place to roast marshmallows and the back area is enclosed with a fence for privacy. The summer kitchen has two KitchenAid gas grills, perfect for cookouts! There is also a commercial ice maker which can produce up to 200 lbs of ice during the day. There is a commercial grade margarita machine (available for rent) located in the summer kitchen and is perfect for making drinks on a hot day! This machine also makes delicious non-alcoholic drinks for the little ones! Welcoming you into the home is a spacious living room with 12’ ceilings. Relax and unwind on the sofa and chairs for while enjoying the beautiful views of the pool area. The dining area offers seating for 10 at the table, and 4 more at the breakfast bar. There is additional outdoor seating and tables located in the summer kitchen. Continuing on the first floor, you will find the gourmet kitchen. Adorning the kitchen are the beautiful quartz countertops and a generous sized island that is perfect for preparing large meals. There is abundant cabinet space for storage. The combination of the stainless-steel appliances and Cambria quartz countertops create an elegant atmosphere. The elevator entrance is located just off the kitchen in the main hallway leading to the pool, laundry, and full bathroom. Completing this level, you will find a Queen Suite and a full bath just off the sitting area. Upon entering the second floor, you will find the game room featuring a Brunswick pool table, large flat screen TV and a high-top table and chairs. There is also a large balcony off the game room, overlooking the pool for relaxation. Completing this level are 4 large King Suites, all with private baths. One of these King Suites includes 2 sets of twin bunks in the room. On the third floor you will find a media room with a large TV and a gaming console. There is a bath shared between the bunk room and media room. This floor also has 3 additional King Suites with private baths. The Master King Suite features 2 sets of custom twin bunks. There is a custom-built bunk room with 1 set of full-over-full bunks, 1 set of twin-over-twin bunks, and 1 individual twin bed (sleeps 7). Located in the garage is a paddle board for guests to use in the Gulf. The owner is also providing (at an additional cost), a six-person, street legal electric GEM golf cart. This is perfect to use for shopping and going back and forth to the beach and local restaurants! Born to Sun is in the Frangista Beach community which consists of mostly vacation rental homes where families come to vacation and spans approximately 4 blocks. The neighborhood has a 400-yard private beach which you must have a code to access. This home is within walking distance of shopping, dining and beach access. *Handicap-Accessible: All common areas of this home are located on the first floor along with a queen suite with its very own private bath and features a wheelchair accessible ramp entering into the home along with a elevator that services all floors. 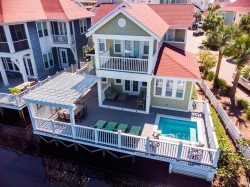 *This home requires Sunday to Sunday rentals during our Summer Season and Saturday to Saturday rentals during our Spring Break Season. Pool Heat - From October 1st - May 1st, the private pool/spa can be heated for an additional $75/day or $525/week. Pool heat must be purchased for the entire stay. Seasonal Beach Chair Service - Our complimentary seasonal beach service is offered for our Summer/Fall 2019 months. This includes 4 chairs and 2 umbrellas set up daily on the beach from 9am-5pm. Our Season begins on March 2, 2019- Ocotber 31st, 2019. Margarita Machines - In SELECT Beach Reunion homes we have placed a commercial frozen drink machine (margarita machine) which produces beverages usually only found in restaurants and bars. The machine is available for use the moment you arrive; no delivery is necessary! These popular machines allow you to enjoy your favorite frozen drinks and/or virgin slushies pool side or while lounging on the beach. They are the perfect addition to family vacations, weddings, business retreats, golf outings, fishing trips, church groups or any other type of gathering. Upon arrival, you will find your frozen drink machine along with 6 different flavor options. Each mix produces 4 gallons (51 - 10 oz. servings) of frozen drinks. The first mix is always complimentary and each additional mix used is $20 billed at the end of your stay. Free beach chair service included from March 2nd, 2019- October 31st, 2019. Free concierge services - our concierge can help you plan the vacation of a lifetime! Fully stocked kitchen! It’s like cooking at your own home! This luxury home will have everything you need and more. Grill out by the pool. This home will be fully equipped with an outdoor kitchen, seating area and fireplace!